This page provides the latest online Help information for gbData. gbData allows the user to create a 3D plot data entered in a spreadsheet format. Excel97 files containing the data may be opened directly or values may be values may be entered manually into the built-in spreadsheet. gbData uses four windows. The Main and Data windows are where most of the work occurs. The Properties and About windows are used as needed. The Main window contains the 3D display and the Data window provides a spreadsheet view of the data (Z-axis) values that will be plotted. gbData is so simple to use that all of its features are accessed through a single toolbar in each window. Neither the Main nor Data windows use menus. VRML is used as the 3D display file format. Every time a new image is displayed, gbData creates a temporary file, 'gbData.wrl', which contains the VRML code for that image. The content of that file may be viewed by clicking on the left panel of the statusbar. gbData uses Notepad to view the VRML code. To save a copy of the VRML file of a particular display, simply call up the VRML code and use the File/SaveAs features of Notepad to save the file under a different name. Display of subsequent images will recreate the gbData.wrl file as needed. This window shows the contents of the opened file (Excel97 and other text formats are supported), or of the data values entered by the user into the built-in gbData spreadsheet. The gbData display is created using the lower/left cell of the spreadsheet as the lower/left point on the display. Likewise, the upper/rightmost cell of the spreadsheet is used as the data point for the upper/right point on the display. Any spreadsheet cell left empty will be plotted as a zero value. gbData actually support multiple spreadsheets - the same workbook format normally used in Excel or other spreadsheet. Pressing the Plot toolbar button will plot the data contained on the currently selected spreadsheet of the workbook. With the Append property checked, each press of the Plot function will add (not replace) a new image to the 3D display. The object is to allow viewing of multiple spreadsheets at one time, although you can use Plot to the the same spreadsheet multiple times. gbData does not require entry of the XY values. Instead, the array of Z values is plotted using even spacing (which may be adjusted by the user to get the best possible display). ScaleFactor - gbData plots the Z values supplied by the user, but sometimes the values are very close and need to be "exagerrated" to show the differences. This setting changes the display height by ScaleFactor but does not change the underlying data contained in the worksheets. Spacing - gbData plots the Z values supplied by the user with a separation of 1 unit. Sometimes the display is more easily viewed with different spacing values. This setting changes the display spacing to the value of Spacing but does not change the underlying data contained in the worksheets. AutoScale - Forces the legend and gradient colors to map to the hi/low data value entered in the spreadsheet. User Scale - Forces the legend and gradient colors to map to the HiScale and LowScale values (rather than the max/min data values). This provides a better way to compare two plots whose data ranges are not the same. Color1 - Sets the color used for sheet 1 when the Spectrum option is disabled. Color2 - Sets the color used for sheet 2 when the Spectrum option is disabled. Color3 - Sets the color used for sheet 3 when the Spectrum option is disabled. Background - The background of the 3D image can be cycled through 8 different colors. 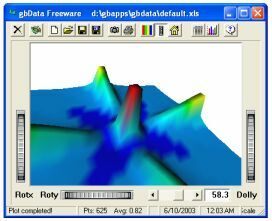 Spectrum - 3D images may be plotted as a single color, or using a gradient of colors corresponding to the range of data (red is max, blue is low). This setting toggles between gradient and single colors for plots. Angled Startup - The normal, flat 3D view doesn't show the 3D relationship so to eliminate the need for the user to rotate the image each time using the mouse, this setting will automatically rotate the image each time a Plot is executed. Reset To Home - gbData usually used the same rotational position when a new Plot is execute. With this setting, you can return to the startup rotational position of the image before a Plot is executed, resulting in the same position for each new plot. 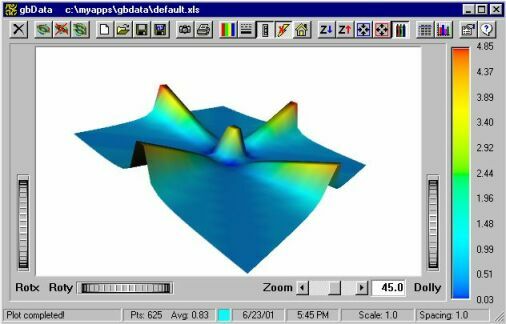 AutoPlot - Normally, you must manully press Plot to display the data in 3D format. This setting automatically Plots each time a value is changed in the spreadsheet. Antialiasing - Adds antialiasing of the image edges to the display. Note: This take significant processor power and will slow down gbData. It is best used to smooth the image before capturing the image with Copy Image. None/A-B/A-ZAverage - Creates content for sheet 3 of the workbook. Content created according to the option selected.